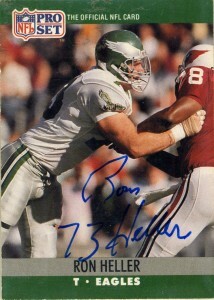 The Co-Captain of Penn State’s 1982 championship run, Ron Heller was an offensive tackle at drafted in the bottom of the 4th round of the NFL draft by the Tampa Bay Buccaneers. The 1984 was a good draft and Heller was a fine specimen at 6’6″, 290. A highly intelligent lineman with a good motor, Heller was both a competent pass and run blocker. Starting immediately out of the gate, Ron would be named to numerous All-Rookie teams at the end of 1984. Playing in obscurity for 4 seasons for the Bucs, Heller would be traded (in 1988) to the Seahawks who in turn traded him to the Philadelphia Eagles, where he’d block for Pro Bowl quarterback Randall Cunningham. 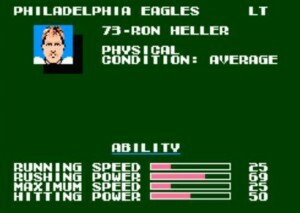 Ron would become the first Eagles offensive lineman named offensive MVP of the team in 1989. I’d get his autograph at training camp in 1992, before he signed with the Dolphins to block for Dan Marino in 1993. He never missed a beat, starting immediately, and fit right in with the team for 3 seasons. A brutal knee injury would end his career after the 1995 season, but Ron would move on to coaching. He’d finish his playing career playing in 172 games, starting 166 of them. In 2004, Heller served as an assistant in NFLE on the Amsterdam Admirals. He’d expand on these jobs as an offensive line coach in 2006 and 2007 would allow him to be an offensive coordinator, before the league’s untimely folding. Ron then joined the Toronto Argonauts of the CFL in 2009 for one season, and then returned to the NFL as an offensive staff assistant for the Jacksonville Jaguars in 2010. Dan McGwire. Now that is a blast from the past. A giant, towering specimen of a quarterback at 6 feet 7 inches with good bloodlines (Mark McGwire’s brother)- Dan, played collegiately at Iowa and then transferred to San Diego State for his final two seasons. It was at San Diego State McGwire would pile up the yards and really earn his stripes in the WAC with a 146.8 quarterback rating his senior season. 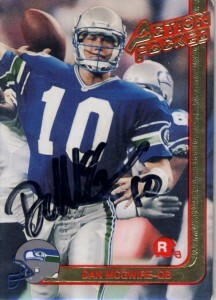 The Seahawks would go so far as to make him their #1 pick in the 1991 draft and the franchise’s first quarterback ever drafted in the first round as the team’s quarterback of the future to replace the never aging Dave Krieg- (AKA the Steve DeBerg of Seattle). McGwire would only start one game in limited playing time in 1991 and 1992 making little or no impact. 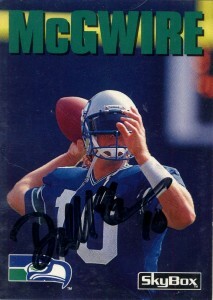 The Seahawks would alarmingly respond by drafting their second quarterback ever drafted in the first round- Rick Mirer in 1993. In limited playing time Dan would throw for his first career touchdown that year backing him up. Things began to look up for the former first rounder when in 1994 McGwire saw the most playing time of his career playing in 7 games and starting 3 finishing with a 60.3 qb rating. 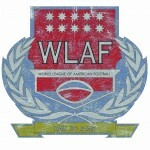 In 1995 Dan would head over to Miami playing in one game and would retire after the season. Without really thinking about it- McGwire does go down as an NFL draft bust, in a draft that overall had great collegiate statistical and credential talent on paper and hideous results in the pros. There is only one quarterback that rose from the ashes of the whole draft- and that would be All World Brett Favre. Otherwise nearly every quarterback from the 1991 draft was out of the NFL by 1995. In the end, McGwire would finish with two touchdowns and six interceptions, and only 13 games under his belt. Since football Dan has become president for a vitamin enhanced H2o drink company and lives in Reno, NV. Big Frank Okam was a dominating force in college playing for the University of Texas. Okam would contribute all four years of college and garner regular looks from pro scouts, was named to the Big Twelve squads on multiple occasions and helped the team make win the national championship in 2005. At 6’5, 350 Okam was considered a two space gap stuffer at the pro level who could play not only defensive tackle but kick inside and play nose tackle, but injuries in his final season and questions about Frank’s heart and desire to play football caused his stock to drop. 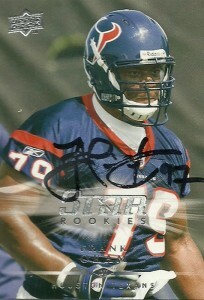 The Texans would draft Frank in the 5th round of the 2008 draft, and he would suit up for 5 games making 2 tackles. In 2009 he’d suit up for 3 games but never see playing time, with injuries taking their toll on the young player, so in 2010 with the writing on the wall after 5 games and only a tackle under his belt, he would be cut by the Texans in October. He’d sign with the Seahawks- cut again- and then found himself on the roster of the Buccaneers for the final 3 games, where things are looking up for Frank as he made 10 tackles to close out the season. I was pretty jazzed about this pick by the Texans and thought to myself that the ‘desire’ issue was just a bunch of hooey. Sometimes watching him during the preseason, he’d show flashes of brilliance completely controlling the line and then in others get completely blown off the line. Quite the enigma. I hope that with the complete defensive philosophy change, Okam over the next few years can turn into that space eater I remembered from the University of Texas.